Scripters believe in efficiency, automation, working smarter and not harder, etc. You’ll sometimes hear them say something like “Any process which is repeated once or more should be scripted”. Myself, I am not the world’s greatest scripter. I have to work at it. Thus my personal threshold for committing to a scripted method is higher than one repetition. In my environment, I did come across a particular process which needed to be repeated 20 or more times – Answering a virtual machine question. Based on what I’m working on, conceivably I was going to run into this a lot more. This is a great candidate for scripting. The Virtual Machine Message I’m faced with deals with the relocation of the VM. 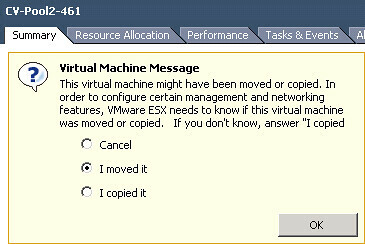 Via the vSphere Client, my possible choices to answer the question are “Cancel”, “I moved it”, or “I copied it”. I don’t have the patience or desire to mouse through this hundreds of times. Note that there are different types of Virtual Machine Message questions which will yield a different set of possible answers. 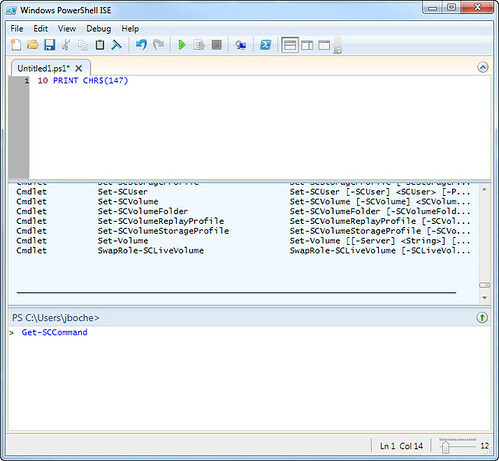 Be sure to query a VM having a question via PowerCLI for the possible answers to that question. Get-VM | Get-VMQuestion -full should do it. Once the possible answers are revealed, use Set-VMQuestion -Option to provide an answer. 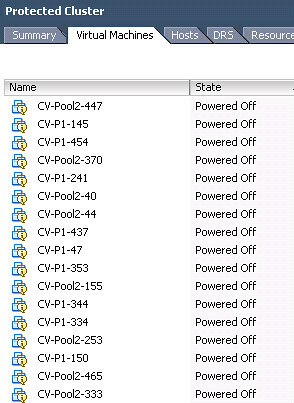 Also note the script above will cycle through all VMs in inventory, and for those having a question, it will provide the same response for each VM. Thus the assumption is made that all VMs with pending questions have the same question being asked. 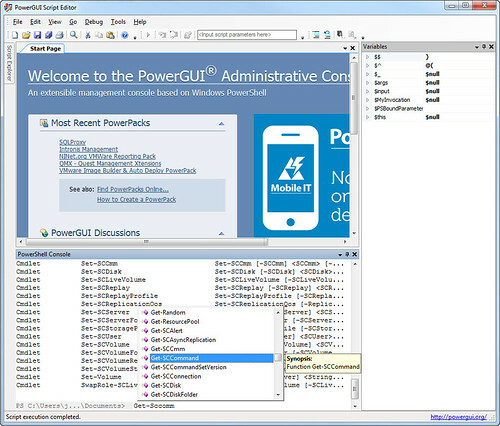 To respond to explicit question types or to filter the VMs being looped through, the script would need to be refined. 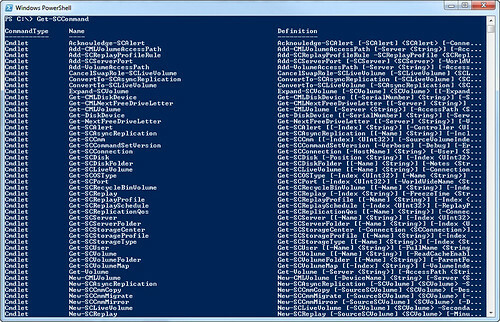 For more information on the Get-VMQuestion or Set-VMQuestion PowerCLI cmdlets, use Get-Help Get-VMQuestion -full or Set-Help Get-VMQuestion -full respectively. Update 6/30/15: I ran into a situation with vSphere 5.5 Update 2 and PowerCLI 5.8.0.6734 where “I moved it” was not being recognized as a valid answer to the question, yet I needed to provide this as the correct answer.